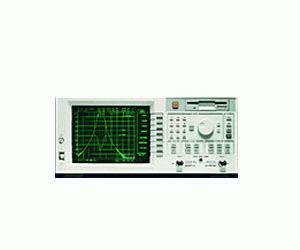 The Agilent 8714ET features a built-in transmission/reflection test set with a full range of magnitude and phase measurements. Two independent channels can measure and display two device parameters, such as transmission and reflection response, in a variety of formats including complex impedance, SWR, and delay, on rectangular, polar or Smith-chart displays. These analyzers also employ vector-error-correction techniques to enhance measurement accuracy. For a wider range of output power levels to test active devices and components, Option 1E1 adds a 60-dB step attenuator as a standard feature, which extends the lowest power-level setting to -60 dBm. Both 50-ohm and 75-ohm versions are available. The 1.3 GHz 8712ET and ES models and the 3 GHz 8714ET and ES models are available in both 50-ohm and 75-ohm versions. With the addition of S-parameter measurement capability, the Agilent RF economy network analyzer family has evolved to meet today’s test demands of higher-performance components. This capability brings new levels of accuracy, convenience, and affordability for testing RF components. S-parameter network analyzers let you measure the forward and reverse characteristics of your components without having to disconnect, turn around, and reconnect them to the analyzer. They also provide full two-port calibration to give you the best measurement accuracy possible. Depending upon your application, you can choose the optimum performance level of an S-parameter analyzer (ES models) or the lower cost of a transmission/reflection analyzer (ET models). With both frequency and power sweeps, Agilent RF economy network analyzers let you quickly and accurately characterize the linear and nonlinear performance of your RF components.